Bored of having same hair style everyday? 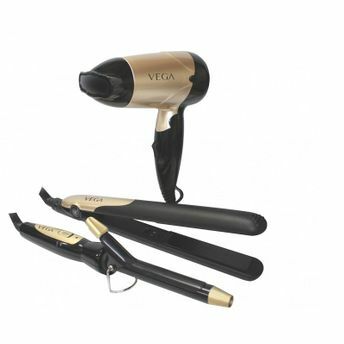 Get Vega Miss Versatile Styling Set, a perfect combination of style and quality to look different everyday. This set has hair dryer, straightener and curler. The hair dryer has two speed heat settings with convenient and foldable handle. The straightener has ceramic coated plates to give you silky, shiny and frizz free hair with smooth gliding without fear of tugging or pulling. The set also includes hair curler, to get instant, smooth and glamorous curl. Warp your hair around the barrel, use the clamp to hold it and create natural curls without kinks. The ultra-light weight body of dryer, straightener and curler making styling superfast and easy. Explore the entire range of Multi Stylers available on Nykaa. Shop more Vega products here.You can browse through the complete world of Vega Multi Stylers .